Here is a selection of some of stories I reported and wrote. 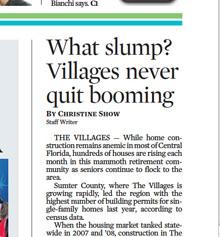 I pitched this A1 enterprise story after talking with a source, who mentioned how different the economy within the area in The Villages is from the rest of the state. I did research and found that The Villages had the most new construction in Central Florida and the second-most in all of Florida. After getting a press release about a lawsuit involving a local dead trucker and driver fatigue, I researched the rules on truck drivers and the rest they needed. 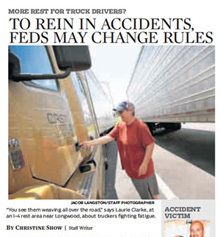 I learned that the Federal Motor Carrier Safety Administration was in the process of changing their rules on the issue. I used the local trucker’s story as an anecdote and expanded the story to have a national appeal. 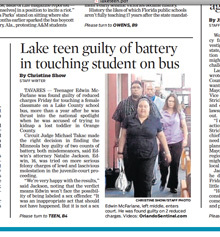 This is a breaking-news court story, in which I covered the trial of a teenager accused of touching a female student on a bus who had previously gained national attention in Orlando when police arrested him a year earlier for suspected kidnapping (the charges were dropped in the kidnapping case). I wrote an ongoing story for the newspaper’s website and snapped photos of the teen. One of the photos was used for the actual print publication of the story and for the online edition. After writing online all day, I wrote a fresh story for the print version under tight deadline pressure of only a half an hour. One of the city governments I covered had plans to start implementing smart-grid technology, so I developed this enterprise story. 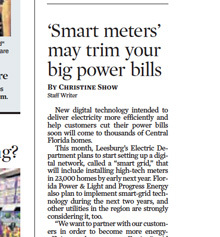 I broadened the topic of smart grid, discussed its growing popularity in Central Florida and nationwide. I also explained how smart grid will affect electric customers in the future. 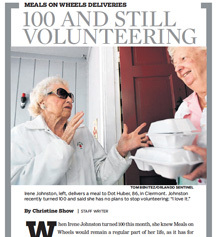 A reader called in about a 100-year-old woman she knew that volunteered for Meals on Wheels. I decided to explore how the poor economy affected programs like Meals on Wheels while detailing how dedicated this woman was in trying to help others. I was able to blend this woman’s life and her work as a 100-year-old deliverer with the bigger issue of the growing need for services like Meals on Wheels. Copyright © Christine Show | All Rights Reserved.